ST. GEORGE – With a start of a new year in St. George comes start of a new road project. Signs have appeared on Bluff Street advising motorists that the long-awaited work on the northern part of Bluff Street is starting Monday. The Bluff Street project is slated to last a year and will widen the roadway between 100 South and Sunset Boulevard to three lanes in both directions, and revamp the Bluff Street-Sunset Boulevard intersection, among other improvements and upgrades. State and city road planners say the roadwork will help Bluff Street better handle increasing traffic flows as the area continues to grow over the next 20-40 years. 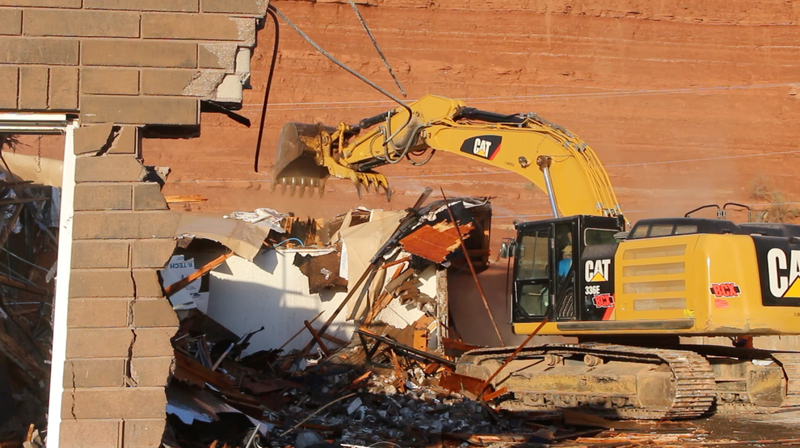 In preparation for the road widening on the northern part of Bluff Street, a number of buildings were leveled, forcing the businesses they once housed to relocate. Read more: So what is this Bluff Street project all about? Jan. 8: Contractor will begin installing traffic control along the corridor. Jan. 8-10: Daily traffic shifts; changing traffic patterns; moving traffic light heads for better visibility; lowering manholes and water valves on the southbound lanes in preparation for asphalt milling. Jan. 10: Traffic is switched to the east side of the road with one lane in each direction and a center turn lane in preparation for asphalt milling. Jan. 15-20: Crews will begin to remove the current asphalt surface on the southbound lanes with rotomiling from 100 South to 1250 North. After the asphalt has been removed, access to properties and roads on the west side of Bluff Street in this area will be a compacted and milled asphalt until all utility improvements have been completed. Crews will be working each day, Monday through Friday, from about 7:30 a.m. to 5 p.m. There will be some Saturday work. Additional shifts will be added as conditions permit. Kevin Kitchen, of UDOT, told St. George News Thursday that motorists would benefit from finding an alternate route around the construction, particularly during peak travel times. Upgrading and improving all utilities that are buried in the current roadway, including storm drain, culinary water, sewer, fiber optics, gas, electrical and an upgraded advanced traffic management system. Increasing capacity by adding an additional northbound and southbound lane from 100 South to 1250 North through this heavily traveled section of road. Adding a dedicated right turn lane from westbound St George Boulevard to northbound Bluff Street to improve safety and mobility. State and city road planners have said for years that improvements to northern Bluff Street are needed in order better handle current and future congestion concerns that accompany the area’s continuing growth. Bluff Street carries over 44,000 vehicles every day, with that number expected to climb to 65,000 by 2040 as the population climbs from over 150,000 to around 321,000. “It will be a great facility and will benefit the city for years to come,” Kitchen said. UDOT is overseeing the project due to Bluff Street actually being the southern end of state Route 18. And a Good Time will be had by all who venture to brave this much needed construction! Ya know, the more I look at the diagram of this project. It appears that the only improvement is to the bike lanes. Just the thing we need on Bluff St. Spandex wearing peddle power heads riding in packs. Next we will have to redo the Blvd to inlarge the bike lanes. Tell me again how much a bike rider pays for road use and upgrade. People who walk and bicycle pay their fair share for use of the city roads. Walking and bicycling inflict virtually no damage on roads and streets, and take up only a tiny fraction of the road space occupied by vehicles. Bicyclists and pedestrians likely pay far more in general taxes to facilitate the use of local roads and streets by drivers than they receive in benefits from state and federal infrastructure investment paid for through the gas tax. That being said I in no way support the common law breaking that many cyclist think they can get away with. Bicyclist have the same rights as any vehicle on a road, but also must follow the same laws. The proposed intersection will only help a little… In 6-8 years I’m certain they’ll be tearing it up and building some sort of grade separation (like their original drawings showed). My biggest beef with this configuration is that traffic going east on Sunset and turning right to go SB on Bluff will no longer be free flowing. Now they’ll have to stop to let southbound vehicles through. When you spend millions of tax dollars to improve an intersection, please don’t add an extra stopping point! By coughing up a couple million dollars now and building this right (with grade separation), you could be saving tax payers many millions by not tearing it back up in a few years! The only real improvement at this intersection is the addition of the pedestrian tunnel! Adding a third lane for the EB Sunset -> SB Bluff movement isn’t really an improvement if you put a stoplight at a spot that used to be free flowing. 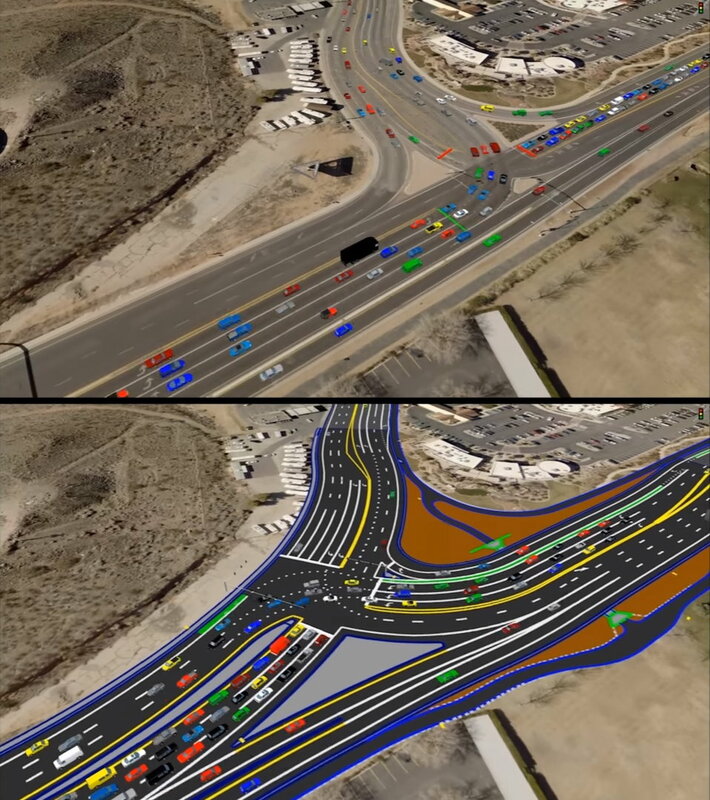 I’m more than sure it will be another St. George/UDOT Engineering Marvel. There will Still be a Stop Light and traffic backed up . . .
Or is southbound on Bluff being sent another direction ?